The Spotlight Shines on Dr. Bartholomew White! 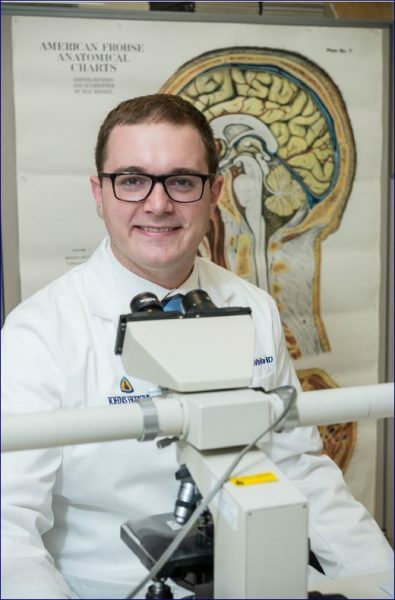 Dr. Bartholomew (“Bart”) White is the Peter C. Burger Fellow in the Division of Neuropathology at Johns Hopkins Hospital. Dr. White was born and raised near Akron, Ohio, a small city south of Cleveland. Growing up in a family of six, he spent most of his time reading books and playing sports. He was selected out of high school to complete an accelerated medical school program with two years of undergraduate studies at Youngstown State University, followed by a traditional four-year medical school at Northeastern Ohio Medical University. Along with his brother and sister, Bart is a graduate of Northeastern Ohio Medical University. Following medical school, he began his pathology residency at Penn State Hershey Medical Center. Bart is currently working on an NIH Alzheimer’s Disease Core Grant to study degenerative diseases and is involved in a variety of research primarily centered on Alzheimer’s disease, but he is also working on other disease processes, including ALS and Pick’s disease, to name a few. When Bart moved to Baltimore to work at Johns Hopkins, he said it was the first time he lived in a city. He has come to greatly enjoy city life in Baltimore, saying it lives up to its nickname of Charm City. In his free time, Bart also continues to enjoy reading a good book and playing competitive sports. The Spotlight Shines on Dr. Amy Zhou!